The Cloakware logo is a solution-level logo created to leverage the long-standing experience and reputation of the Cloakware company and brand, a security software company acquired by Irdeto in 2007. Black and green logo on white background. White and green logo on black background. White logo on purple and green background. There are also two grey-scaled versions for black and white printing: black on white or reverse, white on black, where the logo will be white with light grey as shown below (40% black). There is a minimum clear space in order to prevent interference with the logo. The minimum amount of clear space around our Cloakware logo should always be half the height of the logo. If the logo height is 200px, then the clear space around the logo should be 100px. Do not alter the coloration of the logo. Do not create an outline around the logo. Do not alter the position of the elements. Do not place the logo inside a frame. Do not print the logo with a drop shadow or any other effect. Always follow the minimum clear space rule. Irdeto is our primary, corporate brand and Cloakware is a solution-level brand. As such, the Irdeto logo is to be used in combination with the Cloakware logo in all cases. We have developed a special version of the Irdeto logo for this purpose, which contains the word “by” before the word “Irdeto” along with unique coloring. The “by Irdeto” logo ensures that the Cloakware logo ties back to our corporate brand. 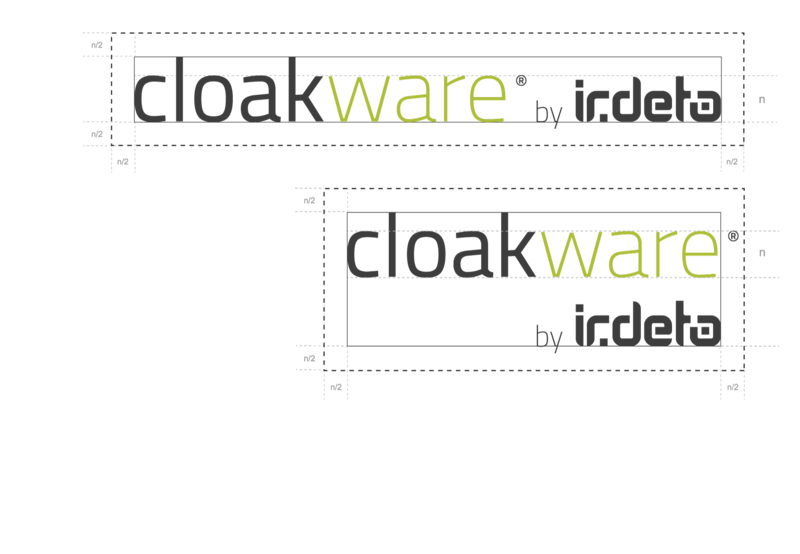 The color of the “by Irdeto” logo should be the same as the “Cloak” part of the Cloakware logo. If the “Cloak” part is black, the “by Irdeto” part should be black; if it is white, it should be white. Other variations of the logo (or the creation of new logos) are not permitted without getting permission from the Irdeto Creative & Digital Marketing team.